Worried about market volatility? Don’t be. Just start making “lopsided bets” like Christopher Columbus, the Italian explorer, navigator, and colonist. Today is Columbus Day, whereby we officially celebrate the anniversary of Columbus’s arrival in the Americas in October 1492. Columbus completed four voyages across the Atlantic Ocean under the aegis of the Catholic monarchs of Spain. Columbus undertook great risk and a leap into the vast unknown; his chances of success appeared slim. And yet, his lopsided bet paid off with untold wealth and it changed the course of civilization. Fast-forward from the 15th century to the 21st. Warren Buffett makes the same sort of lopsided bets. You can use these bets to leverage risk to your advantage. The financial press loves to quote Buffett, and why not? He’s worth $88.4 billion, so he must know what he’s doing. Let’s look at one of Buffett’s key tactics for handling today’s investment climate — a climate that’s fraught with a multitude of risks both at home and overseas. Whether the market is moving up, down, or sideways, this method allows you to double, triple or even quadruple your money, without shouldering undue risk. 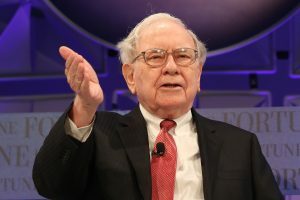 Buffett is famous for being a value investor, whereby he pinpoints stocks that trade for less than their intrinsic values. Many of the world’s smartest investors apply this concept and it’s a major factor in how they got so rich. It’s how an obscure navigator named Columbus took a small handful of ships to open a portal to The New World. If you want to make serious money, you should understand how it works and leverage it for your own gains. Buffett’s Berkshire Hathaway (NYSE: BRK.B) is one of the world’s greatest success stories, but it hasn’t racked up returns in a linear fashion. Buffett is 88 years old and he’s seen his share of rallies and crashes, crises and panics, and booms and busts. Through it all, asymmetric investing allows him to balance risk — and spot a “bottom” for superb entry points. Asymmetric investing is a strategy whereby the outcome of a trade probably has more profit than loss or risk taken. The upside potential may be greater than the downside loss, or the downside is limited but the upside is unlimited. “Asymmetric” is the absence of symmetry. As applied to investing, it means the risks versus the rewards are imbalanced. An asymmetric portfolio entails fewer scenarios where the investment has the potential to lose money and, if it does lose money, the amount lost is limited. This method preserves capital and offers downside protection. There are more scenarios where the investment has the potential to profit, and when it does the profits are significant. How does this method differ from conventional investing? Like most investors, you probably weigh risks and returns in a way that’s more directly correlated. For example, you already know that a small technology stock has more risk than, say, a large-cap tech, but the upside potential is greater. The large-cap stock has more upside potential than a stock mutual fund, but the individual equity confers higher risks. A stock mutual fund has more upside potential than bonds, but the risks are higher…and so on. It’s a familiar “weighing scale” and it’s fine for investors who are content with making relatively modest gains over the long haul. But it’s no way to become wealthy. If Columbus had weighed risks in a linear fashion, he would have been afraid of crossing the ocean. He never would have left Europe. Consider the math underlying asymmetric investing. Stocks can only go down 100%, but their upside is unlimited. But many of the investment world’s top money managers embrace asymmetric investing. They usually don’t use the term, but it’s how they became billionaires. Sure, sometimes they make a losing bet, but over time an asymmetric approach will hit pay dirt for outsized gains that trounce the market. You may not get a national holiday named in your honor, but this method can ensure the steady accumulation of wealth. John Persinos is the managing editor of Investing Daily. Want more details about asymmetric investing and how it works? You can reach him at: mailbag@investingdaily.com.